Karting is one of the cheapest forms of motorsports around, it is a great starting point for learning racing skills and generally getting into the driving seat. This is a 200cc 4 stroke kart designed primarily for off road tracks. Driven by the rear wheels you are sure to have fun tearing up the track with power slides, the lowered frame will also give you the ability to maintain huge traction where you need it. Additional Information Products are up to 90% assembled. Minor assembly is required and in the interest of safety it is recommended that you have this product assembled by a qualified, skilled small engine mechanic. To process any warranty claims you may need to provide proof of the product being assembled by a skilled mechanic or a report from them advising the issues. The warranty is a parts replacement warranty and labour is not included, defective parts may need to be sent back for inspection. Before using the product check that all nuts, wiring and bolts are tightened as they can become loose during transit. Always wear a helmet when riding these products. For motorised products a motorbike standard helmet needs to be worn. Always adhere to the maximum load of the product. This item is intended for off road use only. 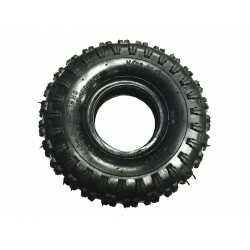 This 4.10-6 tyre is the replacement tyre for the GMX 49cc Junior Quad Bike (GE-YA49D) and GMX 49.. 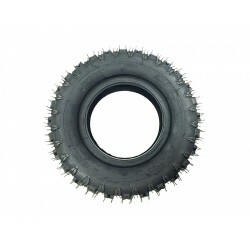 This 13x5-6 tyre is the front replacement tyre for the GMX 49cc Zipper Junior Quad Bike (YX49) a..